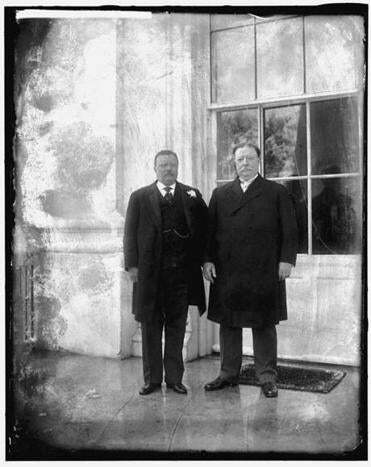 Theodore Roosevelt (left) and William Howard Taft at Taft’s 1909 inauguration as president. Amid the audacious (and highly watchable) political mudslinging of the presidential primary season, it’s easy to forget that these contests are a relatively recent invention and that since their inception they have been an uneasy mixture of philosophical substance, party infighting, and outrageous theatrics. Enter Geoffrey Cowan with his timely and enjoyable new book, “Let the People Rule: Theodore Roosevelt and the Birth of the Presidential Primary.” Cowan, a lawyer and academic, was a major force in reforming the Democratic Party’s nominating process after its turbulent 1968 convention, giving him unique insight into the complicated politics and personalities of the great Republican upheaval of 1912, which saw the creation of the modern system. In Cowan’s telling, the story begins four years earlier, in 1908, when Theodore Roosevelt, at the height of his popularity and influence, honored his pledge not to seek a third term as president. Instead, he helped his friend and protégé William Howard Taft, the secretary of war, receive that year’s Republican nomination, which at that time was awarded by party leaders. Taft went on to easily defeat Democratic nominee William Jennings Bryan. In a shocking reversal, Roosevelt decided to challenge Taft for the Republican bid in 1912. As suited Roosevelt’s personality, this venture bordered on absurdity because Taft, as incumbent president, controlled the party leaders who would name the ticket. Yet Roosevelt saw a chance. Some Republicans, such as progressive Senator Robert La Follette of Wisconsin, had long argued that the nominee should be selected by regular party members rather than by the bosses. These progressives put forward, in effect, the modern system, which has rank-and-file party members vote in primary elections (or caucuses) to choose the candidate that their state’s delegates will support at the national convention. “Let the People Rule” became their motto. Prior to this, Roosevelt had opposed the primary system, Now, however, Roosevelt realized that it might give him an opening because, although he lacked Taft’s influence among the bosses, he was more popular than Taft among ordinary Republicans. He threw himself into the effort — eventually successful — to make the change. The 1912 convention in Chicago was chaos from beginning to end, and Cowan skillfully leads the reader through the complicated, hour-by-hour machinations. While some states had held primary contests earlier that year, others remained in the control of party leaders. Supporters of both Taft and Roosevelt challenged the results in many states, seeking to bar certain delegates, and even offering competing slates of representatives from the same states. Both sides attempted to use bribes to buy votes, and the Roosevelt team even drew up a plan, as Cowan modestly phrases it, “to seize control of the convention by force.” In the end, however, Roosevelt failed. The committee charged with validating delegates’ credentials was composed of Republican bosses, and Taft persuaded them to seat a sufficient number of his supporters to guarantee a victory. The famously portly and mild-mannered Ohioan had outmaneuvered the Rough Rider. Roosevelt and his backers walked out of the gathering and formed the Progressive Party, or “Bull Moose Party,” so named because Roosevelt said he felt as strong as a bull moose. (He made good on the boast a few months later by delivering a 90-minute campaign speech immediately after being shot in the chest by a would-be assassin.) The Bull Mooses were, in fact, less a political party than an expression of Roosevelt’s superhuman energy, charisma, and ego. The group’s only lasting effect was to split the Republican vote in the general election, handing the presidency to Democrat Woodrow Wilson. For all the short-sightedness, opportunism, and ultimate futility of Roosevelt’s campaign against Taft, the primary system he helped to establish has since become the core of both parties’ nominating process, not only for the presidency but also for congressional and state elections. Its advantages and disadvantages are currently on full display. Matthew C. Simpson, a visiting scholar at the University of New Mexico, can be reached at msimpson2@unm.edu and on Twitter @mattcsimpson.